Silicon Valley based IoT Solution Provider set to make strides with their proprietary, Cloud-Agnostic CSensorNet, An IoT Healthcare Accelerator at the leading HIMSS19 Conference next week in Orlando, FL. Clovity, the digital transformation leader for Connected Devices, who is an industry recognized end-to-end IoT, Data, Cloud and Digital solution provider, the creator of CSensorNet and CDataInsights, has correlated the release of their enhanced IoT Accelerator, CSensorNet with advanced plug and play modules further stimulating the Edge-to-Experience journeys for the Connected Healthcare industry at the upcoming HIMSS19 Conference in Orlando, FL on Feb 11, 2019. Given Clovity’s strong association with Enterprise and Fast-paced companies in Healthcare from Ideation to Transformation, Clovity has been curating its IoT Accelerator keeping in mind the technology challenges faced by Connected Healthcare industry and thus providing the necessary impetus to implement sophisticated and multi-faceted connected devices & sensors utilizing a variety of different frequencies for a unified and futuristic Healthcare experience. With Clovity’s deep focus on the Healthcare, Biotech, Healthtech and Life Science industries, its latest innovation reduces development times by substantially and provide end to end edge to experience deployments and data integration seamless through various enterprise systems and touchpoints no matter the complexity. The CSensorNet Healthcare IoT Accelerator boasts new features include Edge Computing, Device Management, Security Encryption, Data Management, User Experience, Data Visualization, and Workflow capabilities providing critical infrastructure to support today’s IoT initiatives. Once deployed this platform can successfully integrate 3rd party services, 3rd part devices, and a Notification engine. With its ability to support Ultrasonic Sensors, Motion Sensors, LDR Light Sensors, Temperature sensors, and at least 80% of current sensors on the market, it becomes a clear choice for those in the healthcare field looking for a long-term, scalable solution. 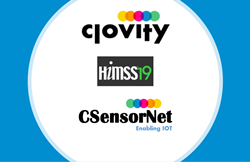 "The Cloud agnostic CSensorNet IoT Healthcare accelerator will help enable speed to market and cost reductions in our customers IoT roadmaps while delivering NextGen functionality and connectivity, all built with underlying security layers"
Clovity’s has already conducted successful deployments and expects their innovative platform to cater very effectively to their existing and new client base in the Healthcare industries focused on scalability, security, and RoI. Connected Healthcare use cases like asset tracking, personnel tracking, way-finding, optimization, Post-Acute Health Monitoring, Continuous Health Monitoring, Telehealth, Medication management, Monitoring and infusion, lab quality control, critical asset temperature monitoring, compliance, and many others will integrate seamless with the CSensorNet IoT Healthcare accelerator turning high and low output devices into a cohesive and encrypted data stream for ingestion. With the right data engineering, cloud partitioning, and user experience to finalize the solution, Clovity can quickly provide greater understanding of the workflow for a complex organization, from people to machinery. Anuj Sachdeva, Chief Executive Officer of Clovity, said that “our further refinements and improvements to the CSensorNet platform were tailored very specifically keeping in mind our Connected Healthcare customers across Biotechnology, Healthcare, and Life Sciences industries due to its heavy data loads, edge computing needs, encryption, sensor hardware, frequency variations and solution complexity.” He adds, “The Cloud agnostic CSensorNet IoT Healthcare accelerator will help enable speed to market and cost reductions in our customers IoT roadmaps while delivering NextGen functionality and connectivity, all built with underlying security layers. Selected as Global Top 20 IoT Solutions Provider for 2018 & again as Top 50 for 2019 by CIO Magazine. Thinking "Agile | IoT | Embedded | Data | ML | AI | Cloud | DevOps | Digital" - Clovity a global Solutions Partner and Systems Integrator focused on transforming enterprises worldwide. Clovity's cognitive strength lies in the amalgamation of two powerful ideas - collaboration and transformation.